TEACHER TOADS – A CRAZY IDEA? Is the idea of releasing “teacher toads” in advance of the main invasion front crazy, or is it an exciting new way to reduce the impact of cane toads on Australian biodiversity? At the 2008 Academy of Science’s “Science at the Shine Dome” meeting, Rick was awarded the Macfarlane Burnet Award for excellence in biological research. In his talk to the Academy of Science, Rick proposed a radical new idea to reduce the ecological impact of toads. It involves releasing a small number of tiny toads IN ADVANCE of the invasion front, to give predators (like quolls and goannas) a chance to learn that cane toads are best avoided rather than treated as food items. We have explained the idea briefly on the REDUCING IMPACT page in this website. 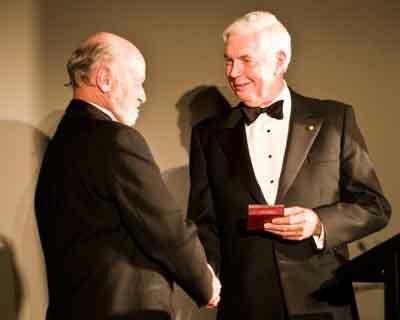 Rick receiving the 2008 Macfarlane Burnet Award for excellence in research from the Governor-General Michael Jeffreys. The idea of "teacher toads" got a lot of media attention. ABC Science online article on teacher toad proposal. The New Scientist magazine article about teacher toads. Not surprisingly, the idea has been controversial. Many people agree that we need to “think outside the box” and to take advantage of TEAM BUFO’s newly-won scientific understanding of toad biology to frame new ways to protect the Australian environment. But some people aren’t so sure! Graeme Sawyer, spokesperson of the Northern Territory’s Frogwatch group, called it a “crazy idea” and “absolute folly” and indeed, suggested that it may reflect extraterrestrial influence (“I don’t know what planet this guy’s off” – see the story from the Northern Territory News below). The idea of “teacher toads” was popular at the Australian Academy of Science, but Darwin’s Lord Mayor wasn’t impressed! So, we thought we should explain a bit more, both about which planet Rick came from (it’s called “Queensland” and it seems like a suitable origin for a toad researcher – after all, the Queensland rugby league team is known as the Cane Toads!) and about what the idea really is. From Graeme’s response, it sounds like he thinks we want to drop millions of cane toads over the entire continent – but Rick’s actual suggestion is not quite so ridiculous. Our idea is to DROP A SMALL NUMBER OF TINY TOADS IMMEDIATELY IN ADVANCE OF THE TOAD FRONT – giving local predators just enough time to learn about toads before the arrival of the main invasion front. This wouldn’t be hard to do. The progress of the toad invasion front has been mapped very accurately over the last several years. Each year the toad invasion has stalled during the dry-season, and all of our radio-tracked toads just find a damp spot and wait for the next rainfall event. As soon as the first rains arrive at the beginning of the wet-season –often, the very next night after the first rains – the radio-tracked animals charge off to recommence the invasion. The front has progressed westwards from about 30 to 70 km each wet-season over the last several years. If we know exactly where the front is at the end of the wet (and that's possible only if groups like Frogwatch NT and Kimberley Toad-Busters are out there to record that advance), we can identify a site - say, 5 km in front of the current invasion frontline - where the toads will CERTAINLY arrive in the following wet-season (and perhaps, within a week or two). We could drop a small number - say 100 - of small toads in that site. Many of those animals will be found by native predators, that will try to eat them. A few native predators MAY be killed – if the predator is very small or unusually sensitive to the toads’ poison – but many will survive. Although the small toads are toxic, they contain only a tiny fraction of the amount of poison in a big adult toad - much less than 1%. Any ECOLOGICAL effect of these tiny “teacher toads” will be obliterated a few months later when the main toad invasion front passes through - the ecological impact of about 100 grams of tiny toads (that is, about 100 baby toads that each weigh one gram) is insignificant compared to the impact of about 1000 kilograms of adult toads (say, about 5,000 adult toads that each weigh 200 grams) moving through the same area a bit later! However, those tiny toads can have a huge BEHAVIOURAL impact. Predators like goannas and quolls are really good at finding prey, and will locate the tiny toads. And many of the predators we have tested are really quick learners – once they have eaten a small toad and become ill as a result, they avoid all toads from then on. 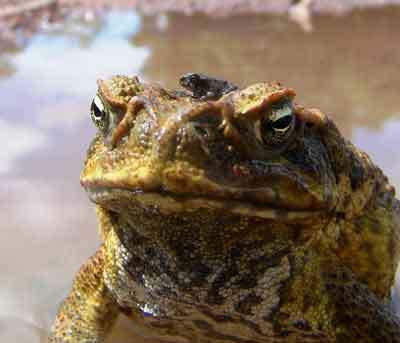 Any predator that has learnt to avoid toads is more likely to survive the actual toad invasion. Cane toads come in a wide range of body sizes! Tiny toads released a few kilometres in advance of the toad invasion front can teach native predators to avoid larger and more dangerous toads. Given the concern by community groups, we decided to test the idea carefully in the field, on a small scale rather than across the broad landscape. Georgia Ward-Fear did this work in collaboration with the Balanggarra Rangers and the Western Australian Department of Parks and Wildlife, in the Kimberley region. At a remote floodplain soon to be invaded by toads, she taught free-ranging goannas (monitor lizards) that cane toads are poisonous, by offering them small toads that were big enough to make them feel sick but not big enough not to kill them. It worked! 18 months later, after the toad invasion swept through, only one of 31 untrained lizards was still alive - but more than half of the trained lizards had survived! The offspring of those trained adult lizards will grow up in a world with small toads around, because the toads have started breeding in the floodplain now. That gives the baby goannas a chance to learn that toads are poisonous, rather than being killed when they meet their first giant toad. So, now we know that "teacher toads" can work. The number of toads to be released can be very small, and the distance in front of the invasion as short as we like. The best way to do this – to choose sites, introduce small toads, and record what happens - would be to involve the people who really understand the local landscape – the community groups. Our studies on quolls and goannas show that the method works. Now we need to try it out at a larger scale in the field. Unfortunately, time is running out - the toads will soon have swept through the last toad-free areas of the tropics. "Teacher toads" can buffer native wildlife, but we have to move quickly or the opportunity will be lost. The community groups now accept that although they can reduce local densities of toads, they cannot stop the advance of toads. Nor can direct removal ultimately keep toad numbers down over the vast expanse of tropical Australia. It's time to try "teacher toads" at a broader scale. Although the idea that Rick has suggested is radical, we hope that groups like Stop The Toad, Frogwatch NT and the Kimberley Toad-Busters will take it in the spirit in which it intended, and work together with researchers to give it a try. The extraordinary commitment and organisation of community groups is a powerful weapon, and we won't control toads in Australia without it. Lastly, we want to emphasise that we have no problem at all with people like Graeme speaking their minds - it's really healthy for there to be a serious public discussion about how we can control toads. 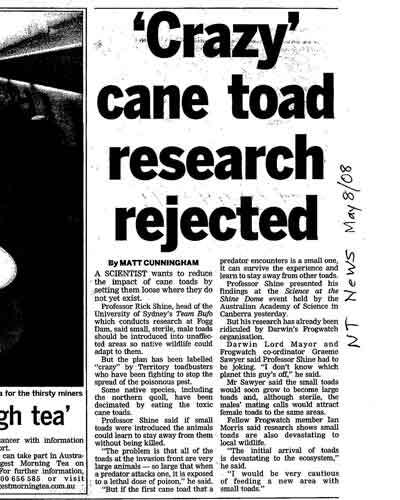 The Aussie public has spent a lot of tax dollars on enabling TEAM BUFO to find out about toad biology in the last few years, and it would be a shame to keep basing control efforts on methods that were developed before we had any of that information. We all need to be open-minded about new information and new ideas.